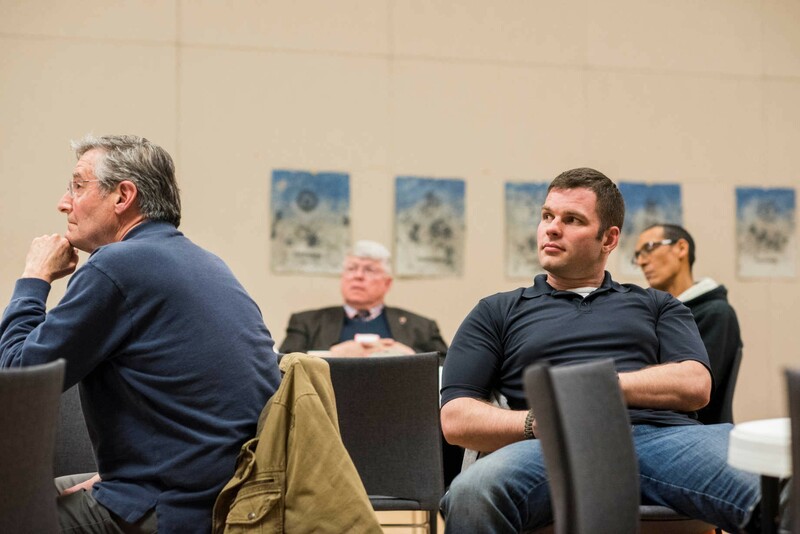 Community veterans learn how to craft and share their six-word war stories at a workshop led by veteran Mike Nemeth, co-author of Six-Word War. Image courtesy of The Telling Project. Silvestri launched the two-year program with a collaborative seminar. Twenty undergraduates learned about the political context for World War I from a historian, war literature from an English professor, war imagery from an art educator, the contemporary Middle East from a geographer, and the challenges veterans face from a psychologist. For their culminating project, students produced podcasts out of oral history interviews they conducted with local veterans. Silvestri then hired the most impressive students to help facilitate interactive, expert-led, creative workshops for local veterans—these were also sponsored by the Spokane Arts Council. A concert and songwriting workshop focused on using music to make powerful personal experiences more accessible and universal. In workshops led by veteran writers and artists, participants experimented with the six-word story form invented by Ernest Hemingway and participated in poetry and art workshops. In addition, Kevin Powers, a veteran poet and fiction writer delivered a public lecture to an audience of 100. 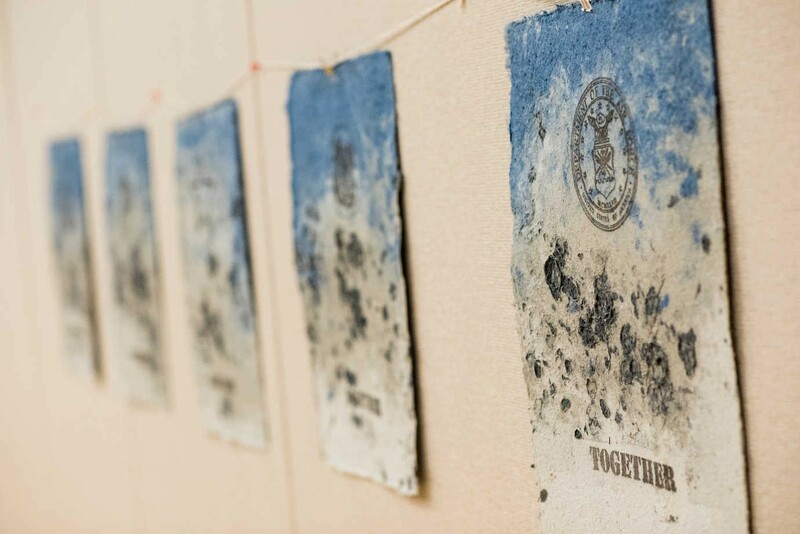 Handmade paper created by community veterans at a Veterans Day papermaking picnic led by Drew Matott, founder of the Combat Paper Project. Image courtesy of The Telling Project. By exploring how other veterans have used different methods to share their stories, participants found new ways to share their own. Moreover, Silvestri noted that “the program strengthened the connections among veterans and community organizations and non-veterans because it drew attention to how much the veteran voice has to offer the broader society.” Telling War attracted significant media coverage, including three half-hour public radio spots, and garnered sustained interest across the campus and community. The project jumpstarted Gonzaga’s new Center for Public Humanities, providing the focus for its inaugural year of programming. “The support that this project has gotten from all these outlets really puts some action behind ‘thank you for your service,’” Silvestri added.